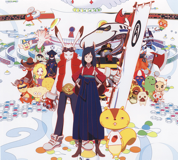 Anime screenings are films which will be shown throughout both days of the convention and cover a variety of genres. Jaycon 6 has not yet chosen any screenings to be shown, but the information will be updated closer to the convention. The screenings listed below are examples of those shown during Jaycon 5 of 2014. There is a train station on the other side of death, yet not all who arrive on the platform will be judged ready for passage onwards. For one unready soul, there will be both a test and a second chance. Rather than be reborn, this soul will awake in the body of 14-year-old suicide Makoto Kobayashi where it must not only find a way to fit into Makoto's existence, but also unravel two mysteries. What is the secret of the great sin it committed in its own previous life and what were the reasons that led to Makoto's suicide? While some may believe the truth to be as plain to see as black and white, "Makoto" soon finds that the real world is overlaid with so many shades of grey and rainbows of colors that even the most obvious of "facts" are not what they seem. The supposedly true story of a 23-year-old otaku (Japanese geek) who intervenes when a drunk man is harassing several women on a train. The otaku ultimately begins dating one of the women, and posts on a website asking for advice every step of the way. 16-year-old Haruka is on a mission to find her mirror - a precious childhood gift from her mother that mysteriously disappeared. While following a strange foxlike creature in the woods, she tumbles into a mystical world where once-cherished toys and treasures go when their owners neglect them. Join Haruka and her new friend Teo on a roller coaster ride of adventure as they contend with the island's greedy ruler - who wants the mirror for his own evil plan! A student tries to fix a problem he accidentally caused in OZ, a digital world, while pretending to be the fiancé of his friend in her grandmother's 90th birthday. Hana falls in love with a Wolf Man. 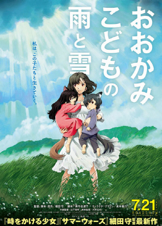 After the Wolf Man's death, Hana decides to move to a rural town to continue raising her two wolf children Ame and Yuki.